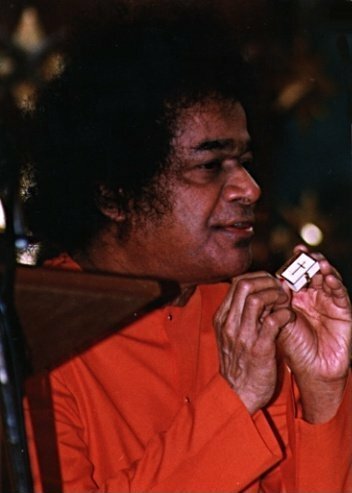 "The essence of all religions, the message of all scriptures and the destination for all mankind is the same," declared Sathya Sai Baba, on Christmas Day, 1996. Baba continued: "Morality and integrity, righteousness and charity, truth and tradition, forbearance and non-violence are basic tenets of all religions. These basic truths are common to all religions. But over the years men have forgotten these truths and have fostered divisive tendencies in the place of unity. As a result, respect for human values has gone. It is essential to recognize the Divine unity that suffuses all the diversity in human existence. "What [Jesus] preached was in accord with the basic teachings of all religions. He engaged himself in a mission of mercy to the sick and the poor. He offered food to the hungry. Seeing his acts of love and kindness, people declared that he was a Messenger of God. Jesus constantly referred to God as the father. Later he declared: I and my Father are one. Jesus dedicated his life to the propagation of faith in one God who is common to all mankind. "Men today celebrate the birthdays of great holy men but they do not follow the teachings of the masters. There is nothing great about the celebration of birthdays. People must resolve to uphold their ideals and act up to their teachings. 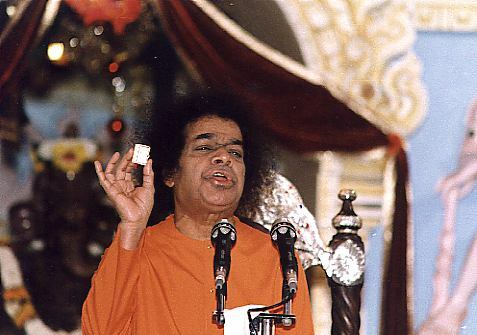 [Sai Baba then referred to a book compiled in Britain around 1530 AD containing all the information about Jesus gathered during the preceding centuries. The Russians condensed all this material in a small book which they preserved in a place on the Black Sea coast. 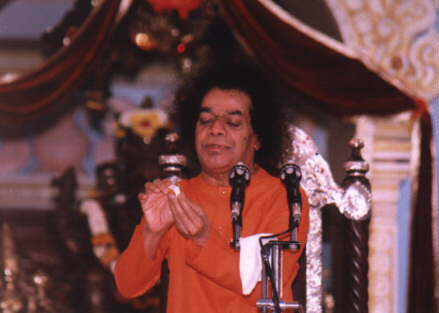 Baba produced the little book by a circular wave of his hand and held it before the audience]. He said: "This is the book. You can see the cross on the cover page. The book was designed to demonstrate the common features of all religions. What is contained in this book is not to be found even in the Bible. It contains an entirely new account of the life of Jesus. "It is not open to all to understand the ways of the Lord. To know about God one has to develop godly feelings. In this book, there are book-mark threads which distinguish every faith by a sloka relating to it. There is one page which contains the sloka from the Bhagavad Gita in which Krishna exhorts Arjuna to give up all beliefs and take sole refuge in Him and assures Arjuna that thereafter he will absolve Arjuna of all the sins. "This book contains the Vedic saying: Ekoham bahusyaam. The same God dwells in all beings. There is no justification for differences on the basis of religion. It is attachment to the body which accounts for religious differences. Do not regard the body as permanent. It is a water bubble. The mind is a mad monkey. Don't follow either of them. Follow the conscience. That is the main message contained in this little book. The culture of Bharat has experienced this truth in the concept of Sath-Chith- Ananda (Being- Awareness-Bliss). "Develop the love of God. All other forms of love are not love at all, but only fleeting and impermanent attachments. Man's biggest folly is forgetting his divinity. All should realize that they come from God. All are children of God. Everyone should seek to get nearer and nearer to God. "That is the message of Jesus - the message of love. Love is God. Live in love. Start the day with love. Spend the day with love. End the day with love. This is the way to God. Only the person who is filled with love will be dear to the Lord. "This book contains the declaration: Yo Madhbaktah. The devotee who is filled with love of God is dear to me, says the Lord (in the Gita). God alone is your unfailing friend. You must acquire His friendship."